Hi! I'm Jessica. 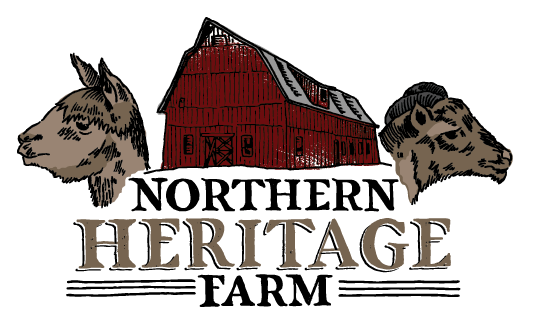 Welcome to Northern Heritage Farm, my dream 9 years in the making. I didn't grow up on a farm. I've spent most of my life living in the city, where I worked as an editor. I used to think I'd be a city girl my whole life. But then something changed. I started longing for nature. I craved doing work that fed my soul, while deepening my spiritual connection to both people and the natural world. I dreamed of fostering creativity and handmade pursuits within the community. It mostly started with yarn. Growing weary of the publishing industry, I started thinking about what I would do if I could get paid to do anything. I had recently enthusiastically taken up knitting, so it was my first thought. This thought expanded as I slowly learned to spin and started to explore where my favorite fiber (alpaca, of course!) came from. 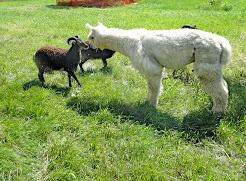 I visited every alpaca farm in a 70-mile radius, and soon fell deeply in love. Not just with the animals, but with the lifestyle as well. I helped out on shearing days, learned how to skirt and sort fiber, administered shots, trimmed toenails, and of course, scooped poo. I loved every minute of it. Even when I got peed, pooped, or spit on (it's rare, but it does happen!). But alpacas were outrageously expensive. And I lived in the city. But I had contracted a full-blown case of Barnheart, and I schemed. The more time I spent on farms and at fiber festivals, the more I knit, the more I spun, the more expansive my dream became. I didn't want to raise just alpaca. I started reading about rare sheep breeds. I fell in love with many of the heritage breeds. There is so much lovely wool out there that many knitters, spinners, and felters are never exposed to. To this end, I'll also be offering fiber from heritage breed animals, starting with my foundation flock of four British soay ewes. You can read more about why I chose this breed on the Animals page. In late July 2013, my husband, Jon, and I sold our house in the city and moved into his childhood home on 140 acres in Western Wisconsin. In July 2014, the first animals arrived--4 British soay ewes. I'm still an editor with a day job in the big city, 70 miles away. But I have an amazing boss who allows me to work from home full-time. What would've been commute time is now spent walking the dogs and doing farm chores. I can also spend lunch breaks in the barn if I choose! That isn't to say that it doesn't get exhausting, working full-time and tending to the farm. I'm still playing with my routine and figuring out what works best. But starting a farm? It's expensive. Even if you're scrappy. So for now, my job is the lifeline that keeps the farm running.